Consumers are from day to day demanding more and more natural and healthy foods. Rangus traditional mill with milling stones, based on a hundred years tradition and ownership by Rangus family, have products which are very popular among bakers. Quality and durability of quartz-based milling stones for milling flour are very well known. Mill Rangus is located in the village Dolenje Vrhpolje, it is a part of local community Šentjernej in Dolenjska region of Slovenia. Rangus mill company is known for high quality milling products, based on common and tartary buckwheat, spelt wheat and other special cereal products, and for making buckwheat and other groats, ecological buckwheat pillows and for fish farming, based on a local creek Kobila. Beginnings of the mechanical water driven flour milling in Slovenia are from the second half of the 18th century. We find also beginnings of this mill in that time. 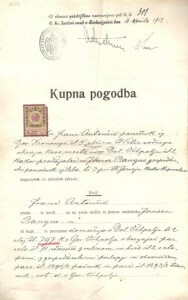 After the first owners, the ownership of Janez Rangus, Dolenje Vrhpolje, started according to the written document on April 16, 1912. Also his son Anton Rangus engaged in flour milling afterwards. Now milling tradition continues by Anton Rangus junior, he is the third generation of Rangus millers.